Among the many things that are difficult to comprehend in this strange universe is what life might be like backstage at a Guns N’ Roses show. 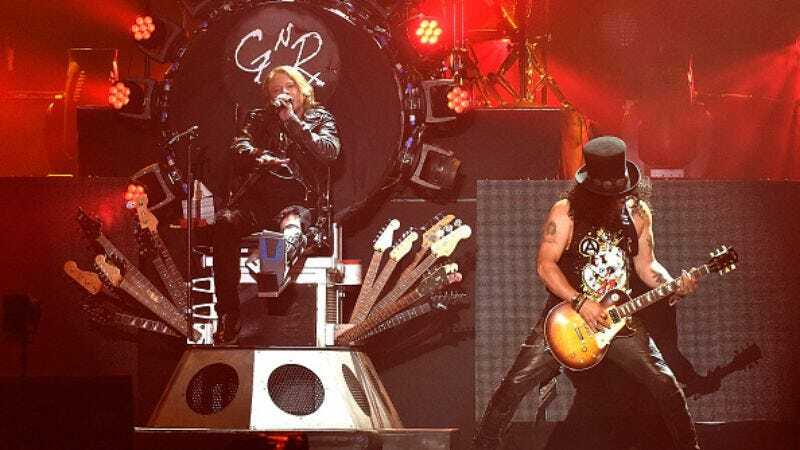 Are Axl Rose, Duff McKagan, and Saul “Slash” Hudson merrily reminiscing about the old times while the stage crew works, or are the middle-aged musicians violently throttling one another until two minutes before the lights go up? Maybe they’re merrily throttling one another. It’s anybody’s guess. However they’re comporting themselves now, three decades after the band’s formation, it can’t be all that unpleasant. Pitchfork is reporting that they’re pogoing off their recent North American tour into a world tour, ensuring that they’ll all be within easy throttling distance of each other for much of 2017. The recently reformed band will start the tour in an intriguingly gothic manner this May, playing in an actual Irish castle, before bouncing around the continent well into the summer and then jetting over to Israel in July. After that, they’ll head stateside for a couple dozen shows in the U.S. and Canada. That is assuming that none of them is dead or in jail by that time. It seems safe to bet against that. The fact that they’ve survived each other’s company this long, and are willing to sign on for more, gives reason to believe they must have really put most of their grievances behind them.